This Royal Canadian Mint Silver Superman Coin is a great way introduce coin collecting to your child, grandchild, or Superman fan. This silver Superman coin has one of the six variant covers associated with Superman Unchained #2 (2013 release). With a $20 CAD legal tender face value and contains 1 oz of fine .9999 silver bullion. This silver Superman coin’s reverse side features various vibrant colors in its depiction of Superman battling a corrupt and covert military force. Here Superman lifts a tank over his head with just one arm. In the engraved background, high-tech tanks close in on the Man of Steel™ leaving a wake of destruction and rubble in their path. Surrounding the reverse image, a series of concentric circles add depth to the design, creating the illusion that Superman is poised to leap out of the coin. This silver coin’s mintage is limited to 10,000 strikes making it very rare. It come encapsulated and presented in a Royal Canadian Mint (RCM) branded customer paperboard box with a certificate of authenticity. Kitco is a trusted leader in the precious metals industry. 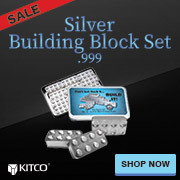 Silver coins and other precious metals sold by Kitco are recognized in bullion markets around the world. With our core focus on gold and silver bullion, you benefit from pricing and premiums that are highly competitive in the industry. At Kitco, we make it easy for you to manage your tangible wealth.